Director/Producer – Sam Liu, Screenplay – Jim Krieg & Tim Sheridan, Based on the Comic-Book The Death of Superman by Dan Jurgens, Louise Simonson & Roger Stern, Producers – Sam Liu & Amy McKenna, Music – Frederik Wiedmann, Animation Directors – Hanhyung Lee, Hyeyoung Jung, Jaebum Lee & Youngsoo Kim. Production Company – Warner Bros. Animation. It is six months after Superman was killed by Doomsday but his body has disappeared. Metropolis now faces four different people all claiming to be Superman. As the four of them clash, Lois Lane determines to get to the bottom of things. The youngest of these is a teenager who is nicknamed Superboy. Lois uncovers that he was cloned from Superman’s DNA by Lex Luthor. However, Superboy becomes big-headed with his newfound celebrity and Luthor has difficulty controlling him. 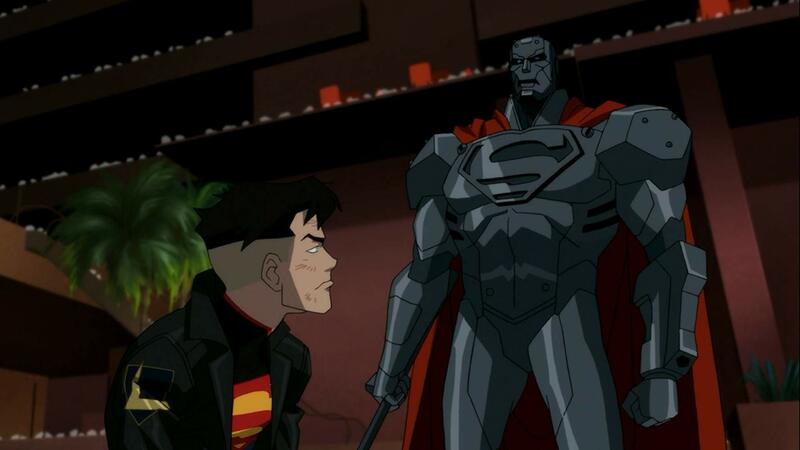 Lois deduces that the figure in a suit of iron armour who is nicknamed the Man of Steel is weapons designer John Henry Irons. Another Superman appears wearing a visor and dispenses justice with robotic efficiency but nobody knows who this is. The fourth is a part cyborg figure who appears to Lois, claiming he is the real Superman but that he lost his memory during the Kryptonian recovery process. However, as Lois and Irons dig deeper, they discover that this is astronaut Hank Henshaw, who was killed on a shuttle mission. He has been revived and is being controlled by Darkseid who is planning an invasion of Earth. Reign of the Supermen is the 33rd of the DC Original Animated Movies. The others have included Superman: Doomsday (2007), Batman: Gotham Knight (2008), Justice League: The New Frontier (2008), Green Lantern: First Flight (2009), Superman/Batman: Public Enemies (2009), Wonder Woman (2009), Batman: Under the Red Hood (2010), Justice League: Crisis on Two Earths (2010), Superman/Batman: Apocalypse (2010), All-Star Superman (2011), Batman: Year One (2011), Green Lantern: Emerald Knights (2011), Batman: The Dark Knight Returns Part I (2012), Justice League: Doom (2012), Superman vs. The Elite (2012), Batman: The Dark Knight Returns Part II (2013), Justice League: The Flashpoint Paradox (2013), Superman Unbound (2013), Batman: Assault on Arkham (2014), Justice League: War (2014), Son of Batman (2014), Batman vs. Robin (2015), Justice League: Gods and Monsters (2015), Justice League: Throne of Atlantis (2015), Batman: Bad Blood (2016), Batman: The Killing Joke (2016), Justice League vs Teen Titans (2016), Batman and Harley Quinn (2017), Justice League Dark (2017), Teen Titans: The Judas Contract (2017), Batman: Gotham By Gaslight (2018), Suicide Squad: Hell to Pay (2018) and Justice League vs The Fatal Five (2019). Reign of the Supermen was the second half of a two-part adaptation of The Death of Superman (1992-3), the top-selling DC comic-book of all time. It follows on from the DC Original Animated Movies’ adaptation of The Death of Superman (2018), which came out six months earlier. The two films played a limited theatrical release on a double-bill two days before the sequel went out on digital platforms. Reign of the Supermen is a solid follow-up to The Death of Superman. Where it works is in the creation of the four Superman impostors. There are more or less as they were in the comic-book. The major difference is that the background of the visored Superman (known The Eradicator in the comic-books) has been dropped – in the original storyline, it was an alien being that was trying to make Superman adhere more to Kryptonian values. The film also drops the villain Mongul, who was revealed to be the principal nemesis, and substitutes Darkseid. Each of the Supermen is drawn with distinctive features and characteristics and a mystery built as to who they are and why they are now appearing. It is this constant interplay between the various Supermen and then revelations about their purpose and identity that makes the film work. The most entertaining of these is Superboy who is given a brashly brattish playing by Cameron Monaghan – it is fun watching him as Lex Luthor tries to control him (even if Rainn Wilson never quite nails the role of Lex with the gravitas of voice that other actors in the part, most notably Clancy Brown, have done). I have never been a huge fan of Sam Liu as director as his superheroic action scenes never quite hit the heights the way they used to back in the heyday when Bruce Timm was in creative control of the DC Universe Original Animated Movies. That said, he does a solid job here. There is an exciting sequence where all four Supermen invade a press conference held by Lex Luthor that ends in a slambang punch-up between each of them, plus a fine climax with the revived Superman, Hank Henshaw and Lois Lane all fighting aboard the newly launched Justice League satellite.